The Hitchhikers Guide to the Galaxy meets The Lovely Bones in this surrealist, sci-fi comedy. When Lorna is run over, she wakes in a hospital in which her nurse looks like a young Sean Connery, she is served wine for supper, and everyone avoids her questions. It soon transpires that she is in Heaven, or on HVN. Because HVN is a lost, dysfunctional spaceship, and God the aging hippy captain. She seems to be there by accident ...Or does God have a higher purpose after all? 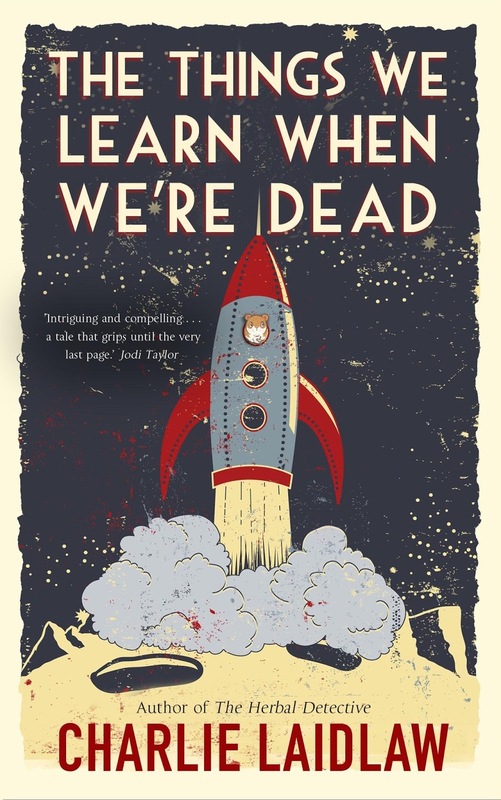 As someone who never reads sci-fi, I thought that The Things We Learn When We're Dead would push me out of my comfort zone, so I was surprised that I found it so easy to read and relate to. I was told before I started it, that it was a modern reworking of The Wizard of Oz. This wasn't really one of my favourite books or films as a child, but I knew it well enough to be intrigued to see what Charlie Laidlaw had done with this classic. Set in Scotland, Lorna Love (what a great name) wakes up in hospital after stepping out in front of a car, but this is no ordinary hospital. There are hamsters in the ceiling (just look at that cute little ginger face peering out of the spaceship on the cover) and everybody looks like a famous celebrity. Lorna then finds out that she is in HVN, a spaceship where only a selected few are chosen to come along for the ride. So why has Lorna been chosen? Does she want to go on a celestial journey or is there really no place like home? This is definitely a book to read with an open mind but it's such an enjoyable book that I devoured every page. It was helped enormously by the numerous references to Star Wars which, in my opinion, is the greatest film of all time. Lorna was a huge Star Wars fan as a child, so I loved her stories of watching it with her brother, Tom. As Lorna's life flashes before her eyes, we read about her life with her brother, Tom, and her friendship with the hilarious character of Suzie. As I had my Star Wars visor on, I didn't always see the links to The Wizard of Oz but, if you're looking to try something new, you'll not go far wrong with The Things We Learn When We're Dead. It's different, refreshing, poignant, funny and as thought-provoking as you'd like it to be. My advice would be: don't take it too seriously, just enjoy your ride aboard HVN.